After my last post, I imagined creating an anthology called Way Better than the Best American Poetry: 2010.Then I had a better idea.I’d like to take submissions from all you who blog on the Internet. I’d like to create an E-Book out of our best and most popular posts. The posts can be essays and a poem, but not a poem without “a post” and not more than one. In an ideal world, I would pay each of you for your submission. What I’m willing to do is to create an E-Book out of our posts that we can each sell on our blogs (among other places). We would sell the E-Book for the same price – maybe a dollar. I would like to produce something by the end of June. This is a new era. This is for those of us who publish on the web rather than in print media. We all have readers who enjoy what we write. 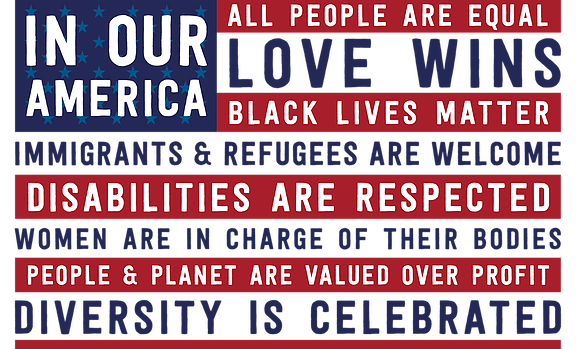 Let’s look after each other and celebrate what we do. Keep it to the English language. The rights to your post or poem needs to be yours. It can’t have been published in any print format. The post or poem has to have been posted in 2010. The focus is on articles and/or editorials. However, if you don’t post articles or editorials, I’ll consider a poem from 2010 if something new is written to accompany it. Please include the number of hits your post or poem has received since publishing it. Please include a link, your name, the name of the blog, and how many hits your overall blog has received. Will everything be accepted? No. I’m going to be judicious. I want to put something together we can be proud of. The length will depend on the interest. My feeling is that the E-Book should max out at 35 entries but, again, this depends on interest. Please include, with your post, a suggested category. This will help me decide how to organize the E-Book: Poetry, Personal, Essay, Confession, Rant, etc… Make up your own if you like. Lastly, this is a new idea. Dates and goals might change. All of you can help shape it. I can’t make it happen without you. If any of you would be willing to help (to be an editor or proofreader or a second opinion with a better idea) I’m glad to accept. How about the artist formally known as Prince? On January 3, 2009, a new website LotusFlow3r.com was launched, streaming some of the recently-aired material (“Crimson and Clover”, “(There’ll Never B) Another Like Me” and “Here Eye Come”) and promising opportunities to listen to and buy music by Prince and guests, watch videos and buy concert tickets for future events. On January 31, Prince released two more songs on LotusFlow3r.com: “Disco Jellyfish”, and “Another Boy”. “Chocolate Box”, “A Colonized Mind”, and “All This Love” have since been released on the website. Dipthong isn’t alone. A number of better known bands, like Radiohead, are increasingly severing their ties with the music industry (their publishers). Meanwhile, up and coming garage bands are “publishing” themselves on You-tube, distributing their own MP3s, promoting their own digital albums and printing their own CDs. So, back in 2006, while Slushpile.Net can write a post entitled Why People Hate Self-published Authors, the responses to the post oddly sidestep the question of perception (which is what the post is all about). Whether or not Slushpile believes Indie publishing, for example, is the same as self-publishing, the perception of most listeners is not so refined. People don’t hate self-published bands or musicians even when they, mistakenly or not, assume they are self-published. Readers don’t hate self-published authors or poets. That’s sheer nonsense. Readers, if they hate anything, hate bad music, bad literature and bad art, but that’s separate from self-publishing. The public s is always ready for good music and good literature. They don’t care how it ends up in their hands. So why the double standard? No one sniffs about “self-published bands” and yet that is precisely what many musicians are doing. They are self-publishing. Their version of self-publishing might be a couple hundred dollars worth of studio and audio software, and maybe a decent webcam. And where, I ask, are the patronizing posts by bloggers and other musicians warning them that, without a producer and label, they’re headed for mediocrity at best, or worse, derision? They may be out there, but they’re drowned out by the public. Maybe times have changed since 2006? Substitute editor for producer and publisher for label. You get the idea. While bands are eagerly exploring ways to publish and disseminate their own work, poets who self-publish are treated like wayward children. Meanwhile, the irony of bloggers sniffing about the self-published seems to be an irony universally (from what I’ve seen) unacknowledged and unexamined. How many self-published articles are there about the pitfalls of self-publishing? I can’t be bothered to count. They serve as their own best examples of what can go wrong. The happy smile, and the accursed damn’d. While some scholars argue that this was an early version, most ascribe this passage to poor memory. The bad quarto comes from 1603, published by the booksellers Nicholas Ling and John Trundell, printed by Valentine Simmes. (See Wikipedia for more information.) The printer, no doubt, was eager to make some profit from a very popular play. A Note on the Folio introduction by Heminge and Condell: What’s so fascinating about the brief introduction to Shakespeare’s first folio (and something that, to my knowledge, no other scholar has commented on) is the implication, possibly, that had “[Shakespeare] himself… lived” he would “have set forth, and overseen his owne writings.” One frequently hears scholars question why Shakespeare showed no interest in publishing his own works, seemingly disinterested in his own literary heritage. But this impression may not be true. Shakespeare would surely have known of Jonson’s effort to publish his own folio. They were friends, colleagues and rivals. The impression that Heminge and Condell give (men who knew Shakespeare intimately) was that Shakespeare intended to self-publish his works. His death seems to have been unexpected by all. For all intent and purposes, a writer’s work was public domain the moment his words spilled from his brain. Anything he wrote was fair game if he did not, himself, self publish. Shakespeare’s friend and contemporary, Ben Jonson, wasn’t about to let his hard labor become the catalog of an unscrupulous printer. The loss of profit to Jonson and his troupe was bad enough, but Jonson had other reasons. He was proud of his work. Jonson lavished tremendous care to make sure the text of his plays were clean and elegant. He was a bricklayer’s son but he wanted to be remembered as a great poet and dramatist. And Ben Jonson was, as far as I know, the first self published poet to issue a collected edition of works and who wasn’t also a member of the nobility. Ben Jonson’s folios, published in 1616, treated his plays as serious literature, rather than ephemera. His folio possibly and probably served as an inspiration to whoever subsidized the publishing of Shakespeare’s plays (1623) – most scholars credit Shakespeare’s colleagues with the effort, but Germaine Greer argues that while Shakespeare’s colleagues may have assembled the plays, it was Shakespeare’s widow, Anne Hathaway, who actually subsidized the printing of the First Folio (an argument that appeals to me). In any case, the first folio was effectively self-published. Jonson knew that if he wanted his text printed cleanly and professionally, he had to do it himself. 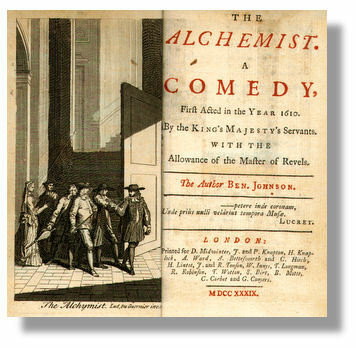 Publication of drama was left, along with much of the poetry and the popular literature, to publishers who were not members of the Stationers’ Company and to the outright pirates, who scrambled for what they could get and but for whom much would never have been printed. 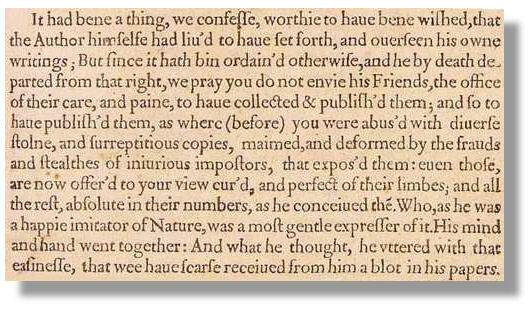 To join this fringe, the would-be publisher had only to get hold of a manuscript, by fair means or foul, enter it as his copy (or dispense with the formality), and have it printed. Just such a man was Thomas Thorpe, the publisher of Shakespeare’s sonnets (1609); the mysterious “Mr. W.H.” in the dedication is thought by some to be the person who procured him his copy. The first Shakespeare play to be published (Titus Andronicus, 1594) was printed by a notorious pirate, John Danter, who also brought out, anonymously, a defective Romeo and Juliet (1597), largely from shorthand notes made during performance. Eighteen of the plays appeared in “good” and “bad” quartos before the great First Folio in 1623. A typical imprint of the time, of the “good” second quarto of Hamlet (1604), reads: “Printed by I.R. for N.L. and are to be sold at his shoppe under Saint Dunston’s Church in Fleetstreet”; i.e., printed by James Roberts for Nicholas Ling. For the First Folio, a large undertaking of more than 900 pages, a syndicate of five was formed, headed by Edward Blount and William Jaggard; the Folio was printed, none too well, by William’s son, Isaac. The functions peculiar to the publisher—i.e., selecting, editing, and designing the material; arranging its production and distribution; and bearing the financial risk or the responsibility for the whole operation—often merged in the past with those of the author, the printer, or the bookseller. With increasing specialization, however, publishing became, certainly by the 19th century, an increasingly distinct occupation. Most modern Western publishers purchase printing services in the open market, solicit manuscripts from authors, and distribute their wares to purchasers through shops, mail order, or direct sales. 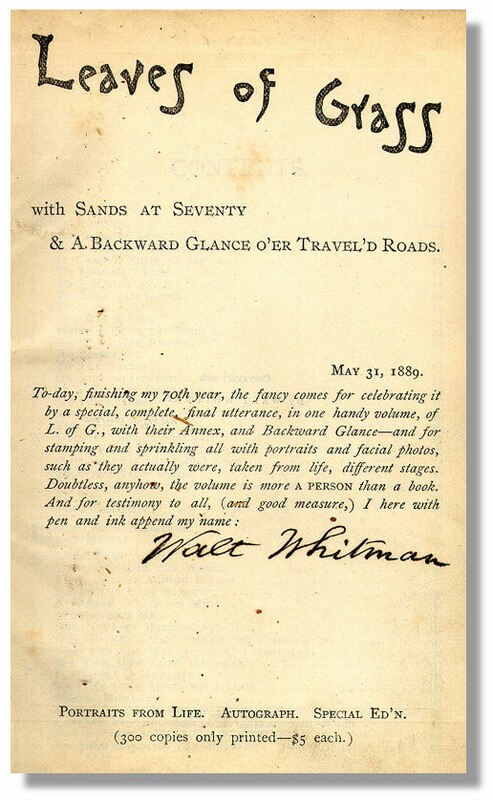 Walt Whitman came of age during this transition to modern publishing. Nonetheless, he self-published Leaves of Grass, and though he never became wealthy as a result, he became a nationally recognized poet. Today, he’s known as one of America’s greatest poets. Emily Dickinson didn’t try to court editors or publishers after her initial negative reception. After she died, her family friend Mabel Todd, and niece, Martha Dickinson, edited and published Dickinson’s poetry — in essence, they self-published. The first nationally known African American Poet, Paul Lawrence Dunbar, also self-published. And here’s a list from John Kremer’s website, the the self-published hall of fame. Margaret Atwood, L. Frank Baum, William Blake, Ken Blanchard, Robert Bly, Elizabeth Barrett Browning, Lord Byron, Willa Cather, Pat Conroy, Stephen Crane, e.e. cummings, W.E.B. DuBois, Alexander Dumas, T.S. Eliot, Lawrence Ferlinghetti, Benjamin Franklin, Zane Grey, Thomas Hardy, E. Lynn Harris, Nathaniel Hawthorne, Ernest Hemingway, Robinson Jeffers, Spencer Johnson, Stephen King, Rudyard Kipling, Louis L’Amour, D.H. Lawrence, Rod McKuen, Marlo Morgan, John Muir, Anais Nin, Thomas Paine, Tom Peters, Edgar Allen Poe, Alexander Pope, Beatrix Potter, Ezra Pound, Marcel Proust, Irma Rombauer, Carl Sandburg, Robert Service, George Bernard Shaw, Percy Bysshe Shelley, Upton Sinclair, Gertrude Stein, William Strunk, Alfred Lord Tennyson, Henry David Thoreau, Leo Tolstoi, Mark Twain, Walt Whitman, and Virginia Woolf. The tradition of self-publishing is longer (if not richer) than the history of modern publishing. So when Slushpile.Net can ask the question: “And what is the ‘long and valued tradition’ exactly?” The answer is in that list of authors. Readers are reading self-published poets and authors every day. So, given self-publishing’s history, why do so many bloggers and pundits act as though self-publishing were a new development? — a modern day smear on the “tradition” of publishing? Why do they wring their hands warning us against an inevitable onslaught of mediocrity? Probably because, along with examples of great literature, there are many examples of abject mediocrity. But self-publishers hardly corner the market on mediocrity. Editors and publishers have published gobs of proof-read, clean and well bound mediocrity. There seems to be an unspoken assumption that if one has the title editor, then one is qualified to publish literature and naturally knows the difference between good literature and bad. Being a good editor is like being a good poet or novelist. Great editors elevate their profession to an art form. However ( just as there are only a handful of truly inspired poets and novelists in any given generation) there are only a handful of truly inspired editors and publishers. All the rest range from qualified to truly mediocre. (The same is true of critics, by the way. Many critics probably wouldn’t recognize a great author or poet if one bit them on their derrière.) Birds of a feather flock together. A mediocre editor, unable to perceive the difference between mediocre and good literature will publish reams of mediocre literature fully convinced that his dossier of poets and authors is the creme de la creme and that his or her judgment is unparalleled. A mediocre critic will sing the praises of a mediocre author and poet. A committee of editors is no better. If committees were insurance against poor judgment, the USSR would have conquered the world. While a good editor can be indispensable, they can’t transmute lead into gold (if they can even recognize gold). This is what happens when a mediocre author is met by mediocre critics. The book, The Joys of Bad Verse, is replete with other examples. And the collusion of mediocrity with mediocrity is as vibrant as it ever was. A reader can look at the back matter of any book, at any number of reviews, and be forgiven if they conclude that the literary world is awash with geniuses. Just because an author is published by a publisher doesn’t mean their work is any less mediocre. And just because an author is self-published doesn’t mean an author’s work is any more mediocre. All the while self-published authors are treated like wayward children. They are warned against sloppy editing and told that they will have to promote their books without the aid of a publisher’s deep pockets. ‘Don’t expect easy success’ – they say. (As though this thought had never occurred to the self-published author). If one is going to spend hundreds (sometimes thousands of dollars) publishing ones own work, these issues have indeed occurred to them. On the other hand, in fairness to bloggers, they don’t necessarily have to think about quality issues or “return on investment”. Most bloggers self-publish for free. They can afford to be mediocre, so maybe these constraints really are news to them. Will there be mediocrity? Yes. But so what? Great art, whether in poetry, music or art, was and is inspired by mediocrity too. And, to be honest, for the majority of readers, poetry doesn’t have to be great to be enjoyed. Novels don’t have to be works of art to be enjoyed. The dread (that authors and poets might not be vetted by an editor) is based on an uninformed knowledge of literary history and an unfounded faith in the talents of editors and publishers. There are good editors and there are bad editors. Why spend so much time discussing mediocrity? Because the idea of mediocrity and self-publishing is tightly interwoven and false. One frequently hears that the only reason an author choses to self-publish is because they couldn’t be “legitimately” published (they’re mediocre). Even a cursory glance at a list of the well-known authors who have self-published should dispel this myth. There are a variety of reasons an author may chose to publish his or her own work. And just because an editor rejects an author’s work doesn’t mean the work is mediocre. It may mean the editor is mediocre. Madeleine L’Engle’s A Wrinkle In Time was rejected more than 26 times. There’s a balanced view to be struck. While self-publishing has bequeathed the world plenty of mediocre literature, so has “legitimate” publishing. Vanity publishing is a pejorative term, referring to a publisher contracting with authors regardless of the quality and marketability of their work. They appeal to the writer’s vanity and desire to become a published author, and make the majority of their money from fees rather than from sales. Vanity presses may call themselves joint venture or subsidy presses; but in a vanity press arrangement, the author pays all of the cost of publication and undertakes all of the risk. In his guide How to Publish Yourself author Peter Finch states that such presses are “to be avoided at all costs.” Because there is no independent entity making a judgment about their quality, and because many of them are published at a loss, vanity press works are often perceived as deserving skepticism from distributors, retailers, or readers. Some writers knowingly and willingly enter into such deals, placing more importance on getting their work published than on profiting from it. A subsidy publisher distributes books under its own imprint, and is therefore selective in deciding which books to publish. Subsidy publishers, like vanity publishers, take payment from the author to print and bind a book, but contribute a portion of the cost as well as adjunct services such as editing, distribution, warehousing, and some degree of marketing. Often, the adjunct services provided are minimal. As with commercial publishers, the books are owned by the publisher and remain in the publisher’s possession, with authors receiving royalties for any copies that are sold. Most subsidy publishers also keep a portion of the rights from any book that they publish. Generally, authors have little control over production aspects such as cover design. True self-publishing means authors undertake the entire cost of publication themselves, and handle all marketing, distribution, storage, etc. All rights remain with the author, the completed books are the writer’s property, and the writer gets all the proceeds of sales. Self-publishing can be more cost-effective than vanity or subsidy publishing and can result in a much higher-quality product, because authors can put every aspect of the process out to bid rather than accepting a preset package of services. Short run printing is also called Print-on-demand (POD) or Print Quantity Needed (PQN). POD publishers generally do not screen submissions prior to publication, and many are web-based. They accept uploaded digital content as Microsoft Word documents, text files, or RTF files, as printing services for anyone who is willing to pay. Authors choose from a selection of packages, or design a unique printing package that meets their requirements. For an additional cost, a POD publisher may offer services such as book jacket design with professional art direction; content, line, and copy-editing; indexing; proofreading; and marketing and publicity. Some POD publishers offer publication as e-books in addition to hardcover and paperback. Some POD publishers will offer ISBN (International Standard Book Numbers) service, which allows a title to be searchable and listed for sale on websites. Many critics dismiss POD as another type of vanity press. One major difference is that POD publishers have a connection to retail outlets like Amazon and Books in Print that vanity presses generally do not. Another comparison is offered at Self-publishing.org. For a more thorough treatment than either of these (and with links to other articles) try Writer’s Digest. I’m also attempting to create a new website, Self-Published Poets, devoted to poets who have self-published. It’s still in a formative stage. The purpose is to provide a centralized catalog where poets can find each other, find each others work – and readers can find us. The poetry of academia has its own network. Self-published poets need theirs. The point of this post was to spell out why self-publishers shouldn’t be embarrassed. I’ve self-published. I’m proud of it. I have books to sell and I consider myself to be in damned good company. Ben Jonson? Walt Whitman? E.E. Cummings? Mark Twain? Count me in. I do think that self-publishing should be strongly considered by poets, perhaps more so than by authors writing in other genres. If a novelist is a good novelist, national ambition isn’t unreasonable. The broader public still seeks out and enjoys a good novel. I can’t imagine that the self-published novelist could ever match the promotional heft of a real publishing house – or realize the same financial gains. The same can be said for children’s writers and YA novelists. If writers in these genres choose to self-publish, I’m all for it, but self-publishing should probably be considered a starting point rather than t he end game. Again, nothing matches the reach of a traditional publishing house. They want to make money. And if you demonstrate that your writing can make money, they will want your work. Self-publishing is a business decision. That’s the bottom line, or so it seems to me. If it makes sense to self-publish from a business standpoint; if you have a plan and the commitment to follow through, go for it. The reading public is still buying lots of poetry, but not the verse of contemporary poets. Contemporary poets like to blame the public, but I blame the poets. In either case, a nationwide audience for a given book of poetry is a long shot. If you have that ambition, I recommend genius – either as poet or self-promoter. Short of that, if you can land a job in academia (a college or university), that’s probably the best way to advance your career. You have an instant audience (your students) and you will be expected to give readings. (The college or university will, in effect, promote you if they think you’re an asset.) And being a poet in academia has the added benefit of an instant network (both good and bad). Another common option is to submit your book manuscript to contests. Many new poets see their first book published by winning such contests. Alternately, a small press might consider you if you have made a name for yourself in poetry journals and chapbooks. These are all legitimate and time consuming ways to pursue a published book. But no matter which route you pursue , small presses reach a comparatively small audience. Don’t expect to make a living from your book’s proceeds. If you can afford it, think about self-publishing. It’s a reasonable option for poets. If you’re energetic and committed, you can probably do as much for your poetry as any small press. But don’t take my word for it. 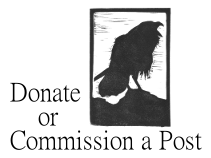 Check out the poets at Self-Published Poets. See what they say and take a look at their books. Of all the links provided (and if you only read one) read Robert Bagg’s essay, the last one listed. “The prejudice against a writer who dares take the initiative with his book after a thumbs down from folks who never read a line of it also makes selling self-published books and small press books difficult. Naida is right. The system is corrupt as is the world. Merit has nothing to with what is published. After spending a year sweating blood to write a novel, tossing it into a sock drawer isn’t easy if you know it’s good. “[I] recently published a blog post on why trade authors, in particular, hate self publishers. Part of it is sincere in the sense that they are trying to prevent people from getting ripped off by author services companies, but a lot of it has to do with the belief that self publishers haven’t earned the right to call themselves “authors”.